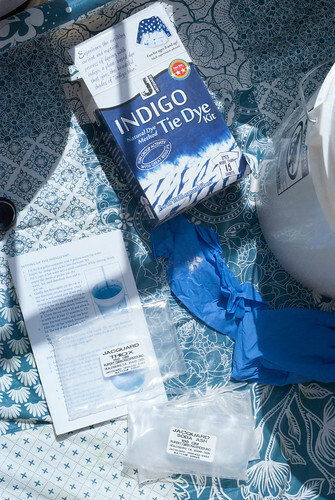 One of the things that I have been meaning to do is attempt indigo dyeing. 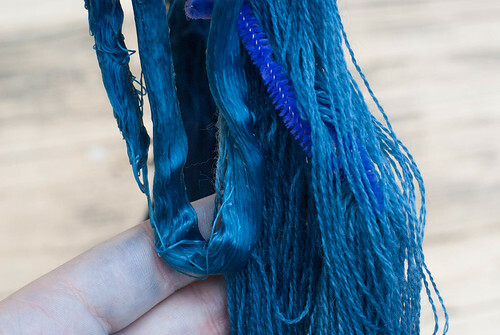 We did it at Willow’s dyeing weekend last year, and since I started knitting the Egyptian Socks of Doom, I knew that I wanted to make another pair with a more period kind of yarn, indigo dsfddyed by me. 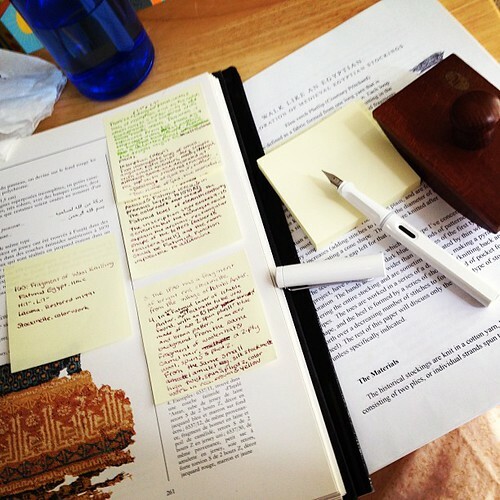 So during a Poppet-free day, I set out to make it happen. First I soaked all my yarn (I figured that since I had a dyepot going, I may as well dye up some silk tram and wool, too) while I got the pot started. This is the kit I used. 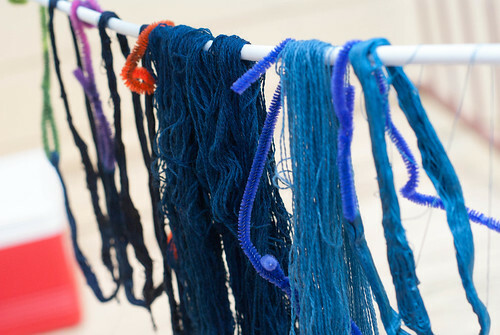 I got it at Knit Picks, but just about anywhere that sells dye materials will have it. After mixing. There is an iridescent blue bloom on the top that Willow referred to as the “mother” and the kit calls the “flower.” I dunno; it’s pretty. Underneath, you can see how green it is. 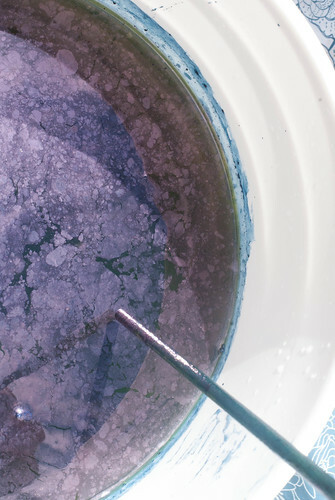 This is the proper color for an active indigo dye-pot. 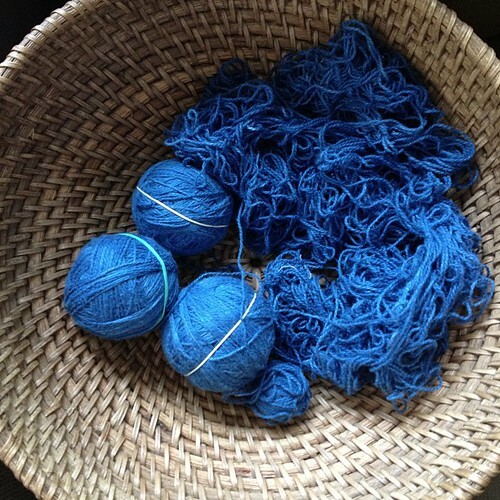 The blue color comes from the oxidation after the yarn comes out of the pot. 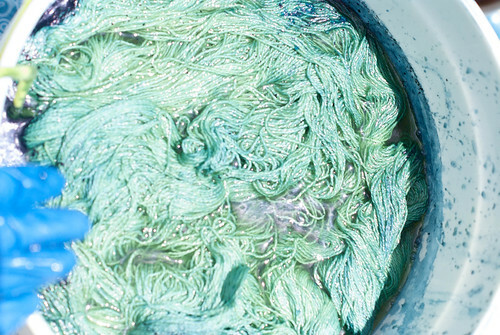 The yarn during dyeing. Look how green! 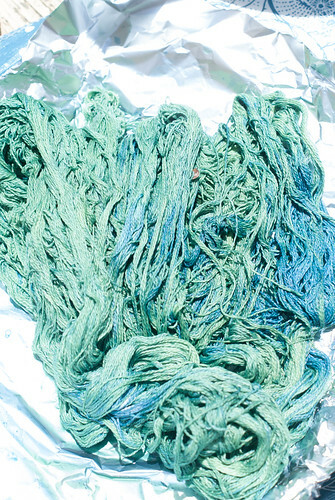 Right out of the dye-pot. You can see the oxidation starting there on the right. 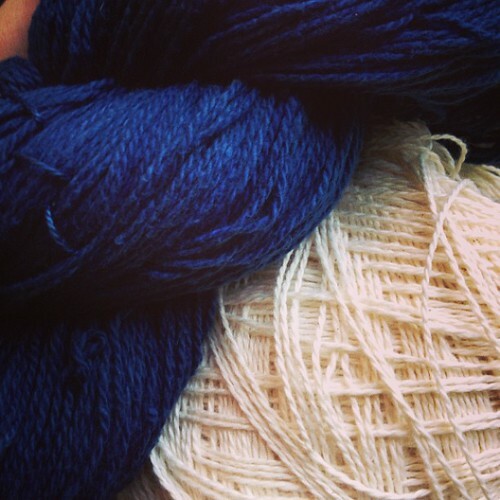 Left to right: wool, cotton, silk tram. The lightest tram in the middle was literally only dipped for a second. I wanted to see how light a color I could get. 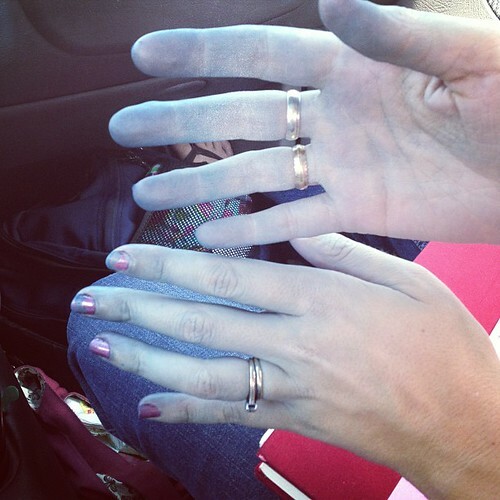 I eventually abandoned my rubber gloves, after the dye spilled over the top. 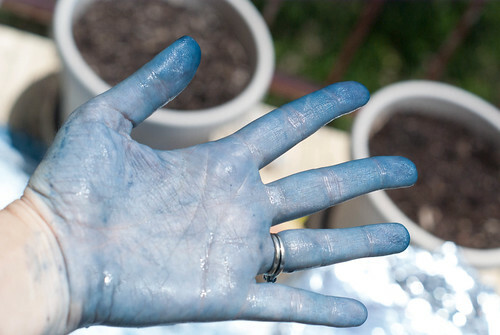 Turns out that 5-gallon buckets are deeper than regular gloves are tall. Luckily I have no job to get mad at me for being part ice-giant. 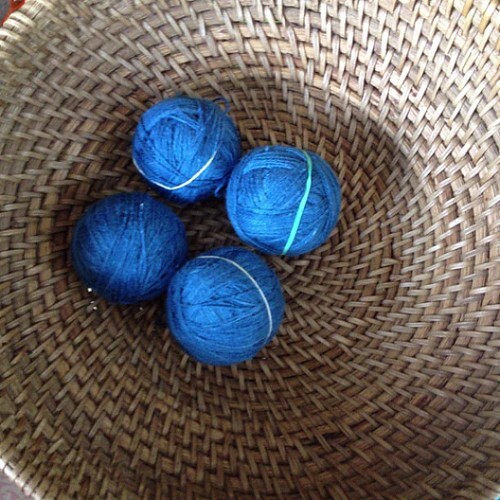 All the Indigo yarn. 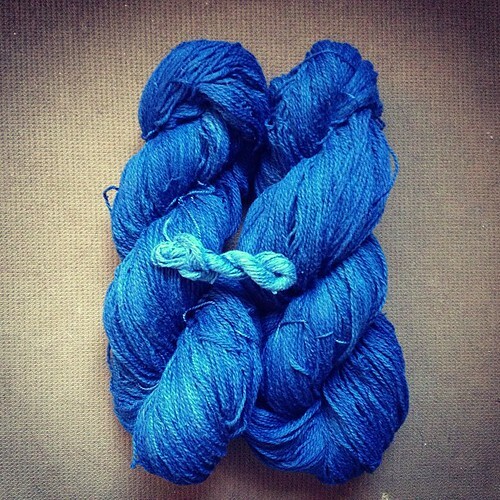 I added a lighter blue wool, too. And then I did something stupid. 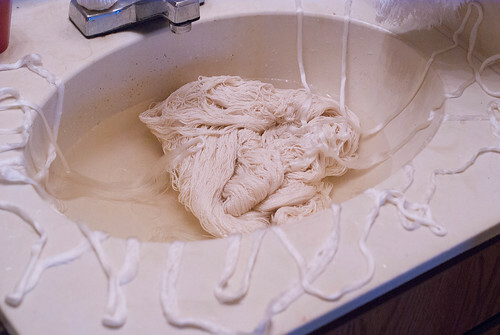 The cotton yarn wasn’t rinsing as clear as I would have liked, so I decided to try rinsing it in the washing machine. 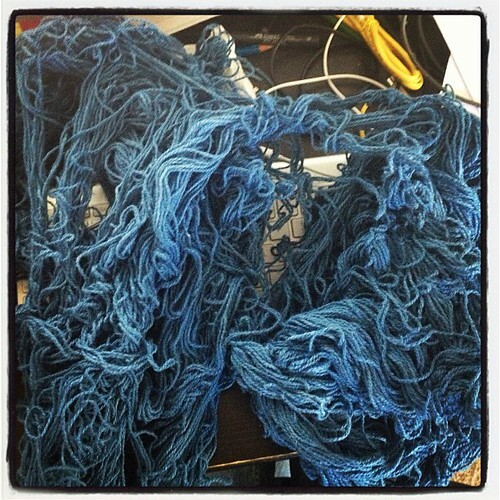 But I forgot to turn off the agitation, so it all ended up a tangled mess. 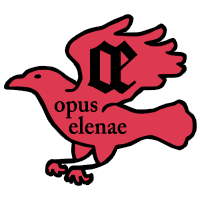 I cut one string, just to have someplace to start from, and in the course of untangling, found the actual ends. I tied buttons to them so I wouldn’t lose them, and continued. It took forever. But ten days later, after much tearing of hair and gnashing of teeth, it was all done. 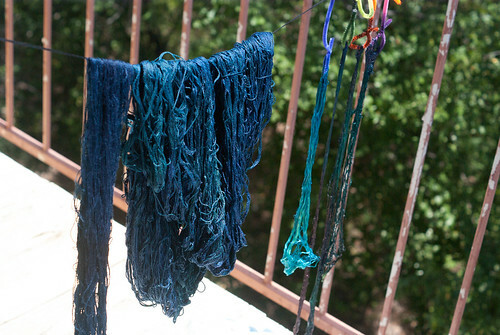 And ready to be re-dyed, since it lost so much color in the agitation. It needs to be navy, not cobalt.